Gecko Car Rental works hand-in-hand with a Namibian tour facilitator to offer pre-packaged and customised self-drive tours of Namibia. Trust our experience to plan your route. Choose from our carefully planned pre-packaged tours or customise your own. We create an itinerary for you based on your specifications and budget. Your journey remains your own private holiday, but your itinerary, accommodation, and car rental are pre-arranged for you by professionals with years of experience in the business. All lodges and activities have been tried and tested and proven to be of the standard we expect for our clients. We also offer advice and support where you need it. Take the worry out of planning and allow us to help you get the most from your journey in Namibia. Namibia has a good infrastructure. Most tar and gravel roads are in a good condition and road signs are clearly visible. 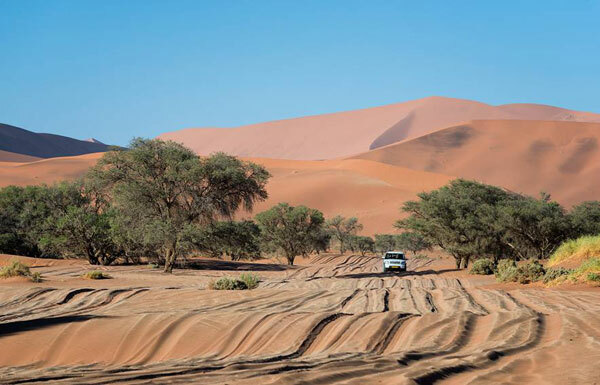 You can reach most parts of Namibia in a standard 2x4 vehicle, but 4x4 vehicles are usually preferred and give you access to more remote places. For those who would like to camp, Gecko Car Rental offers a full range of camping equipment for your journey. Camping can be a more affordable option and Namibia has a large number of camping sites, usually well-kept, throughout the country.